Drawing made for Giovanni Antonio Lappoli, in Borgo Sansepolcro, Vincenzo Borghini Collection, Florence. This account of Lappoli’s painting follows upon Vasari’s telling of the artist’s escape from Rome to Arezzo after the Sack of early May 1527 but also after his subsequent flight from Arezzo for a few months because of the plague. Vasari then goes on to say that not much later Lappoli became guarantor of the contract that Rosso made to execute a series of frescoes for the church of S. Maria delle Lagrime in Arezzo. This took place on 24 November 1528 (see the Preface to D.31-34). Rosso had fled from Rome to Perugia. He then went to Borgo Sansepolcro where he was already by 23 September 1527 when his altarpiece in that town was commissioned (P.19). It cannot be exactly determined when Lappoli visited Rosso in Borgo Sansepolcro at the time that he was executing his Pietà there. Late 1527 is possible, or early 1528. But given Vasari’s remarks about Lappoli having been out of Arezzo for a few months because of the plague and the date of the Lagrime commission, early 1528 seems a more probable time for the visit. Rosso himself visited Arezzo at some time between late March, at the earliest, and April 20, 1528 (see L.22), by which time the Borgo Sansepolcro Pietà may have been completed. Lappoli’s visit to Rosso would quite likely have taken place before this time. 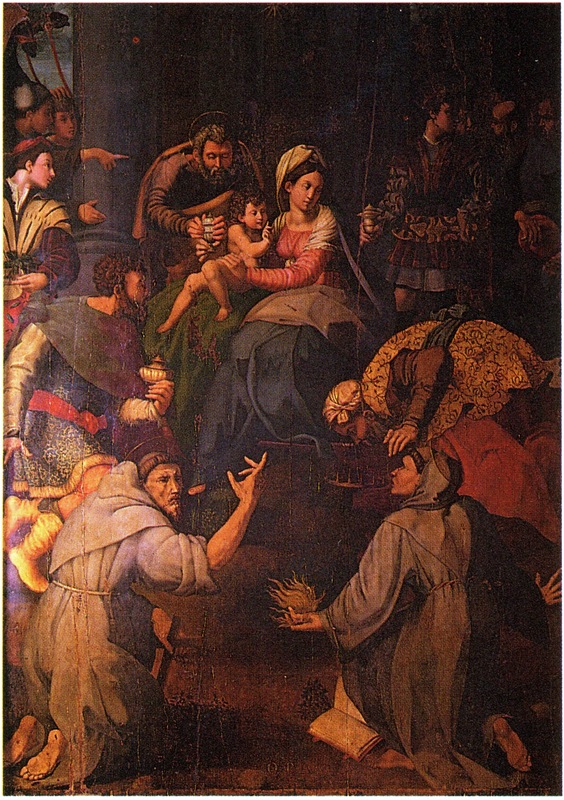 Rosso’s drawing, which Vasari owned and then gave to Vincenzo Borghini, is lost.1 But the altarpiece that Lappoli painted from it has always been identified as the painting still in the church of S. Francesco depicting the Adoration of the Magi with Sts. 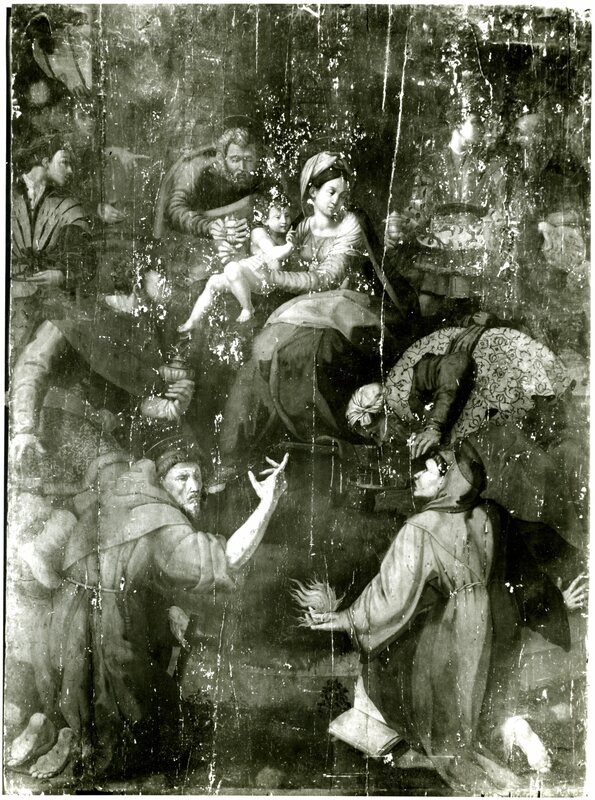 Francis and Anthony of Padua (Fig.Lappoli, Magi a; Fig.Lappoli, Magi, b; and Fig.Lappoli, Magi, before restoration; Kusenberg, 1931, 42, 192, n. 120; Barocchi, 1950, 73, n. 1, 244; Carroll, 1967, 302-303, Fig. 8, before restoration; Freedberg, 1971, 320; 1975, 464; Maetzke, in Giorgio Vasari, 1981, 326-327, no. 5 and Figs. 239, 240, after restoration; Rudolph, 1982, 122; M.G. Sassoli, in Pittura, Cinquecento, 1987, I, 362; Carroll, 1987, 25, 34, n. 64; Forlani Tempesti, 1992, 94-96, Fig. 5); Franklin, 1994, 177-181, Pl. 140; Casciu, 1994, 22, Color Fig., 23, no. 5; Costamagna, 1994, 321, under A113.2 Vasari says only that Rosso gave Lappoli a drawing without specifying what kind. But from the altarpiece itself it would appear that this drawing was quite complete and not merely a drawing of nudes as he had given Lappoli for his earlier Visitation (L.17). The faceting of the drapery and the costumes in the painting resemble those in Rosso’s Sansepolcro Pietà, even if Lappoli has reduced their sharp description and decorative effectiveness. Very much altered would seem to be the heads from what Rosso’s drawing showed, although the head of St. Francis is characterized in a rather Rossoesque manner. Two or three heads at the upper right look like portraits. The general darkness of the painting may well preserve a tonality that was indicated in Rosso’s drawing but that Lappoli might also have seen in Rosso’s contemporary Pietà. 1 Mentioned by Wyatt, 1859, 349; Kurz, 1937, 4; and Ragghianti Collobi, 1974, I, 118. On Borghini’s collection of drawings, see Testaverde Matteini, 1983, 620-621, 642-643, where a print (or prints) by Rosso is mentioned. 2 Oil on panel, 376 x 268; recently restored by Carlo Guido and his collaborators, according to Maetske. Strips about 5 cm. high at the top and bottom are not painted. At the bottom center of the painting the inscription: O.P.A.. Maetske thinks the painting was probably removed from the high altar in the eighteenth century. Brizi, 1838, 101, as on the fifth altar at the left; Sezanne, 1858, 207-208, 306-308, as on the altar of the SS. Sacramento, and as much damaged; Massimiliano Falciai, Arezzo, La sua storia e i suoi monumenti, Arezzo, 1925 (first published 1909), 67, as in the fourth chapel at the left coming from the altar. In 1967 it was on the left wall of the next to the last chapel on the left upon entering the church, where it was placed again after its restoration. 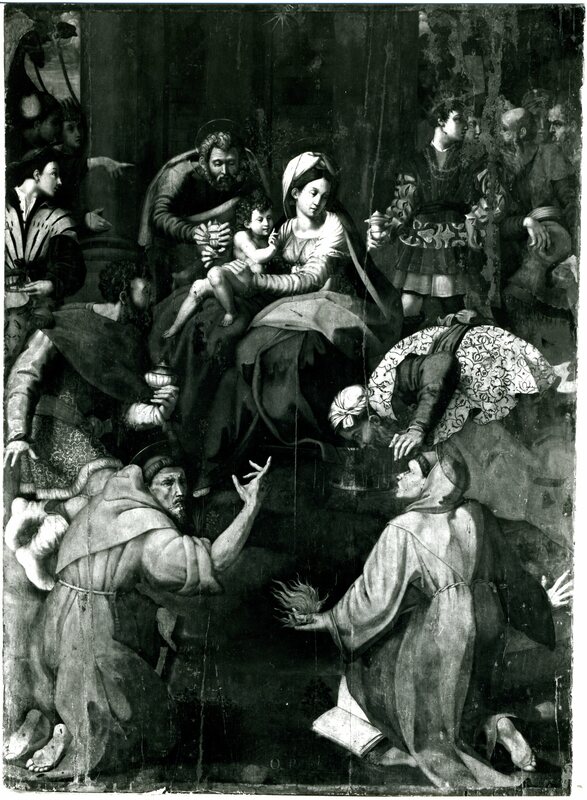 3 Chennevières, 1894, 254-255, mentioned a drawing by Rosso, acquired from Destailleur through the dealer Clément, showing the Adoration of the Magi with the Virgin seated on a platform, the Child on her knees, with St. Joseph behind her to the left, the Magi in the foreground, two monk saints at the left and St. Anthony at the right, and executed in black chalk on greenish prepared paper. Although this description does not exactly match Lappoli’s picture, there is some possibility that it is related to it, if the drawing actually was by Rosso or a copy of one by him. The use of black chalk on green paper appears nowhere else in Rosso’s drawings.